Jiří Antonín Benda is also known by the Germanised form of Georg Anton Benda. He was a member of probably the most famous of all the seventeenth to nineteenth centuries' Czech musical families, and brother of the more famous František (Franz) Benda. His fame as a violinist led to his appointment as second violinist of the chapel orchestra of Frederick the Great in Berlin at the age of 19. He is however, primarily remembered for his part in the development of the German melodrama, a medium which is said to have greatly influenced the dramatic style of Mozart. The music presented on this disc, whilst avoiding that for which he is most famous, proves to be an excellent introduction to his music for smaller forces. It brings together three harpsichord sonatas, five harpsichord sonatinas, a violin sonata and eight songs, all of which are given excellent performances and fill some gaps in the composer's repertoire on disc. The harpsichord sonatas and sonatinas are wonderful works which display an indebtedness to the baroque world whilst looking forward to music by the likes of Haydn. These are works full of poise, elegance and articulation, with even the tiny sonatinas showing a grace that belies their brevity. The sonata for violin and harpsichord shows a composer secure in his own ability on the instrument. It is virtuosic without being flashy and makes an excellent central work around which the rest of the pieces of this programme are placed. The songs, for me, offer some of the best music presented on this CD. They are full of charm with the occasional touch of humour - a real delight. The recording is excellent. The harpsichord has not been miked too closely which gives a degree of naturalistic sound, with Edita Keglerová showing just what a wonderful performer she is. 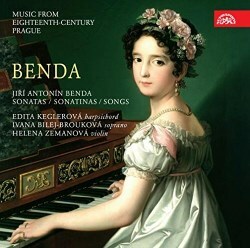 The violinist, Helena Zemanová, seems to have devoted her career to the performance of this kind of music on period instruments, and her intonation blends well with the harpsichord. It is sometimes difficult to get the balance between a harpsichord and a soprano right, but not here. Ivana Bilej Brouková's relatively youthful voice, which does not seem to have been affected by singing too much opera, is in perfect balance with the harpsichord, and in most cases a cello too, for which praise should also be given to the sound engineer, Aleš Dvořák. He certainly deserves it. This wonderful CD is further enhanced by an informative and helpful booklet essay and full texts and translations.